If you made it along to High Country Hops in Beechworth, this pair should allow you to complete no less than nine Bridge Road beers made with fresh hops in 2017. 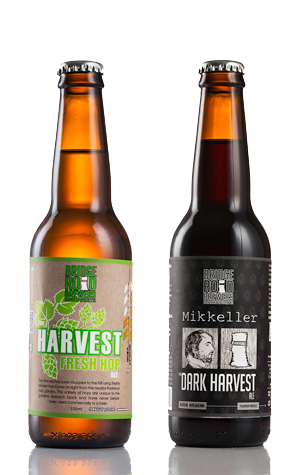 The brewery had a bar at its annual festival pouring six versions of its Golden Ale late hopped with experimental varieties, all created to allow the team to choose which hops would make an appearance in these two commercial releases. And, due to the hops that were chosen being harvested too late to be ready to pour at the festival, you'd also have found a wet hop ale brewed with Galaxy pouring at its main bar. Those for whom these are your first taste of Bridge Road's fresh hop beers for 2017 needn't worry, however, as they're the headliners. The former has been around almost a decade now, while Dark Harvest was first created overnight when Mikkel from Mikkeller was in Australia for events in 2012. This year's Harvest Fresh Hop comes in its usual pale gold hue and, given the vast amount of hop cones that would have been deposited within the brew, is surprisingly soft all round, from the aromas of lime, melon and a touch of grassiness through to its body. The hop characters are reminiscent of another HPA variety, Summer, albeit with more bite and, perhaps, a touch of anise. As for Dark Harvest, its best vintages have not only been among the best beers you can get your hands on, they've also delivered an amazingly enticing choc orange affair of a sort we've rarely encountered. According to brewery founder Ben Kraus, the variety chosen this year had displayed orange characters too, yet the outcome has been rather different. We pick up blackcurrant and berry flavours tucked in alongside the fulsome malts; Ben says it reminds him more of the confectionary character of Mosaic in what's perhaps best thought of as a highly hopped porter.